The only thing they should fear on Halloween are monsters. Halloween night gave many Portlanders a chance to understand how street design impacts our ability to enjoy our neighborhoods. While some parts of the city were deserted, leaving would-be candy suppliers dejected — other places were teeming with kids. We’ve heard that some blocks of the posh Alameda neighborhood had toe-to-toe trick-or-treaters with residents saying they had 400-500 visits. We’ve heard from other people who, sadly, had zero or just a few visits. My family went out with a few others in the Piedmont neighborhood where costumed traffic was pretty light. One family who joined us said they live in the Cully neighborhood east of 42nd. They drove closer-in because their neighborhood doesn’t have sidewalks and they didn’t feel safe walking around at night. But even in our neighborhood with its full grid of sidewalks, we were always on lookout for drivers and on high-alert whenever a spooky porch beckoned on the other side of the street. And if you were online at all this week you probably came across an article based on research that shows Halloween night is one of the deadliest of the year for people on foot. With all that bouncing around my head and with inspiration from a tweet from local urban planner Gwen Shaw and the photos I saw online of a neighborhood in Hoboken, New Jersey (above), where the entire street was closed to drivers, I got to thinking: Why doesn’t Portland have a city-sanctioned program that lets neighbors create carfree zones on Halloween night? We could call them Trick-or-Treat Streets. It’s not a new or scary idea at all. 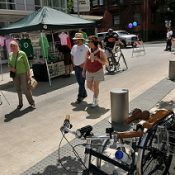 The city has existing community program — Portland in the Streets — that seems to be tailor-made for this type of thing. 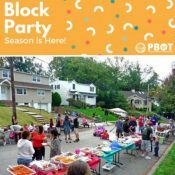 Portland’s neighborhood block party permits are so popular the city recently made them even easier to get. Trick-or-Treat Streets would simply be several block parties stitched together to create an entire zone of streets where families and kids could be safe on foot wherever they roamed. Imagine Peacock Lane (“Portland’s Christmas Street”), but for Halloween and over a larger area. And most importantly — imagine it happening in neighborhoods across Portland from St. Johns to Sellwood and from Parkrose to the Pearl. We should aspire to live in a city where no one has to drive their kids to a safer neighborhood. 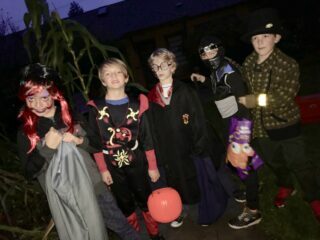 If we can pull off things like Peacock Lane, neighborhood block parties and Sunday Parkways, we can surely do something like Trick-or-Treat Streets. It would seem that beyond poor walkability, unwarranted fear and inherent distrust of neighbors may play a larger role in the steady decline of trick or treating. I was happy to see a reasonably steady stream of kiddos come by the group home I work at in Argay. The folks that live in the home were ecstatic to pass out candy and interact a little bit with people other than paid staff. Maybe like Peacock Lane–an emphasis on Halloween decoration which I see more and more of every year, as well as the trick or treating. 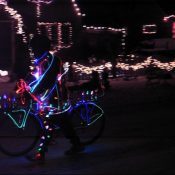 i’m pretty sure there are some streets in the woodlawn neighborhood that do this already! my friends live over there with two little ones. Flyers are handed out ahead of time to let people know the street will be closed off to vehicle traffic, and home owners are encouraged to hand out candy. Perhaps neighbors could close a street using a block party permit. I love this idea! I live in Overlook, and we occasionally get people visiting from other neighborhoods which I love! Usually the parents join other parents walking down the middle of the street or on the sidewalk while kids run around willy-nilly. This year there were a few outliers that I really hope is not the start of a trend: A few adults were opting to follow there kids in their car. They were not driving recklessly, but it really ruins the mood on the street to have a car idling ina parking space, its headlights blinding you for the whole block. Without the car, the low-level of light from the street lights is enough to see kids on either side of the street, but withthe intense glare from headlights, kids disappear, and it puts everyone on edge. Being able to just close the street to cars would make a magical night even more amazing! We have this issue in our neighborhood occasionally. It’s pretty disheartening to see that parents can’t even walk around with their kids anymore. How do they do anything? That behavior is really baffling to me. Are they trying to give their children space, or just too lazy to walk with them? The first few years of Kidical Mass in Eugene, there were a couple of parents who did this. I would usually follow along at the rear of the rides when I attended and would often chat with the driving parents. I just couldn’t find a tactful way to ask them why they were following their child in a car instead of getting on a bike. I never saw any obvious disability, but that doesn’t mean much since many disabilities are completely invisible. My working hypothesis is that this is a part of our current car-dominated culture. The parents were okay with their children going on a bicycle-based outing, but don’t consider bikes as viable transportation or as something serious. It’s kind of like parents at swim meets or gymnastics competitions: go ahead and enjoy the fun kids, but this is just exposure to broaden your base, not a necessary skill. We asked the Washington County event permit coordinator about granting us a permit to shut down a short stretch of road in our neighborhood for Halloween this year. He said that they can’t do it because it would violate their own policy, which doesn’t allow for block party permits outside of daylight hours (though he acknowledge that they DID allow such permits earlier this year, in violation of this policy). He did provide us with some educational materials on teaching kids how to cross the road safely, and a link to the Sheriff’s traffic complaint form. Sigh. Thanks for the information, and while it is frustrating, it is good to know that this is how they think! My take on it is that the barriers are not particularly visible during nighttime, so that might be a concern to them. Perhaps some barriers with lights would be the solution. Thanks for the post, Jonah! I had similar thoughts about how Halloween makes our neighborhood a place where lots of people walk, and how that holiday turns everything upside down (including the children-adult relationship: here is a holiday where the children are “in charge”, venturing out on their own). My six-year old was out with two friends, and she had a great time! I love the idea of making blocks walking only (probably a better term than carfree). I think something like the super-block idea from Barcelona could work. They’ve done it in Boise for quite a while. 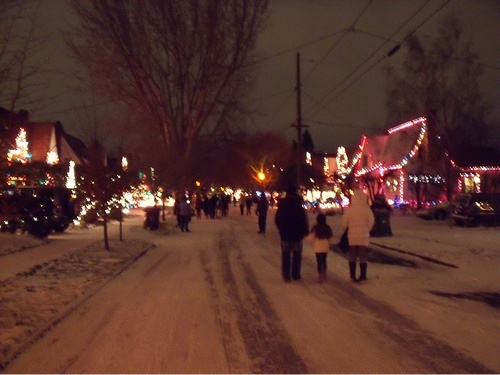 Harrison Blvd gets closed, residents go all out to decorate, kids come from miles around to scrounge free treats, adults mill around with a beverage. So we need to now close the streets for Halloween because of risk associated with activity. Does the endless stream of bubble wrap end somewhere? just to be clear, the activity that creates the risk is the driving… the trick or treating is 100% safe if you remove the threat posed by drivers. It is funny how often folks need to be reminded of this basic truth. Speaking of which, I wonder what happened to wsbob? Where do you need to drive within a neighborhood between 6 & 8pm on Halloween night? The number of small children killed by motor vehicles on Halloween is 10 times the normal rate. I blame it on bureaucrats with no creativity. The Halloween episode of the show Bob’s Burgers features a street shut down for trick or treating and it paints a lovely picture. Would have loved that as a kid. PS Bob’s Burgers is the best cartoon show on TV. Watch it. Now! Great idea. I support anything that allows people to walk in streets. Some of the best streets for walking are the ones without sidewalks, even with a bit of auto traffic. People don’t realize that unless they experience it for themselves. Taking auto traffic off neighborhood streets would be a great tradition to work into Halloween. Halloween night is small stuff anymore. If you paid attention to the national news, three sets of kids waiting for school busses and some girl scouts picking up trash were killed by distracted and speeding drivers in the past few days. And in each case the cops refused to arrest the perps claiming the old “it’s still under investigation” excuse. Watch your back. Nobody else is. My sister had 600 trick-or-treaters, not “small stuff”. It varies a lot by neighborhood. And isn’t working to get cars off neighborhood streets on Halloween “watching your back”? Obviously, the other problems such as you mentioned remain. Multnomah Village already does this: they close Capitol Hwy to vehicle traffic, from just before the viaduct to SW 35th. And the place is mobbed with kids and their parents. Surprised? Jonathan, I’d love to help make this happen for Piedmont next year. Feel free to email me. In Multnomah Village in SW Portland the business community organizes the event. We organize a “voluntary detour” since it’s challenging to close streets with two bus lines from 3:30-5:30 pm. I helped direct traffic away from the trick or treaters, and others helped direct traffic and kids through intersections and crosswalks within the Village. Most drivers voluntarily detoured and those that didn’t knew they needed to be patient. About ~1500 kids and parents enjoy the event. We appreciate that the Multnomah Village Business Association organizing this much safer alternative to trick or treating in neighborhoods with few sidewalks and lots of dirt streets. That’s great to hear Marianne. Thanks for sharing with us. A few folks have contacted me saying they want to do something similar in their neighborhood so I appreciate the inspiration from MV.